The world’s best beers—from Europe’s classics to the latest new-wave microbrew sensations. 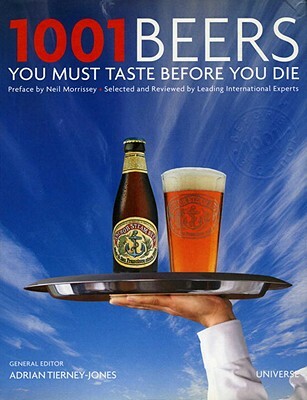 Finally, a book that treats beer as seriously as wine! This latest volume in the acclaimed 1001 series supplies the connoisseurs’ scoop on ferreting out the best among an ever-increasing array of available brews—from exotic foreign beers to the constantly evolving world of American microbrews and homebrews. The book focuses on the world of premium beers—from obscure labels to such traditional yet supremely local brands as Shiner (Austin, Texas), from Czech pilsners to German lagers, Belgian wheat beers, and Trappists ales, not to mention the classic British porters and Irish stouts—every type of beer is covered, making this the "go-to" volume for serious beer lovers. No mere catalogue or encyclopedia, the volume features critical tasting notes and subjective assessments that will help match the right beer to the right occasion. Is this beer light, crisp, and refreshing (good for a picnic), or dry, bitter, and appetizing? Each description includes notes on the flavor and body of the beer, explains why it tastes the way it does, and describes strength and ideal serving temperature. Adrian Tierney-Jones is the editor of The Brewer’s Herald and the author of The Big Book of Beer. He received the 2006 Silver Award from the British Guild of Beer Writers and his work has appeared in The Brewers Guardian and The Daily Telegraph.